William V. Pratt (DLG-13) was laid down on 7 March 1958 by the Philadelphia Naval Shipyard; launched on 16 March 1960 sponsored by Mrs. William V. Pratt; and commissioned on 4 November 1961 Comdr. Boyd E. Gustafson in command. 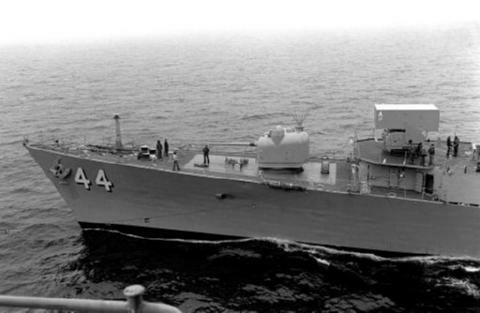 Following shakedown training in the West Indies and post-shakedown availability at Philadelphia William V. Pratt joined Destroyer Squadron (DesRon) 18 as an active unit of the fleet in September 1962. Operating out of Norfolk Va. she crui sed the Atlantic seaboard and the West Indies until 4 August 1963 at which time she departed Norfolk to participate in NATO exercise Operation "Riptide IV " in European waters. She returned to Norfolk in September and resumed normal 2d Fleet operations. T hat employment continued until 8 February 1964 when she embarked upon her first tour of duty with the 6th Fleet in the Mediterranean Sea. She returned to Norfolk on 9 August and once again took up her east coast-West Indies routine. In September and Octob er she visited European waters again to participate in two NATO exercises Operations "Masterstroke" and "Teamwork." The warship returned to Norfolk on 20 October and resumed 2d Fleet operations. In November she began her first shipyard overhaul at Norf olk. She completed repairs on 26 March 1966 and put to sea for trials. On 15 April she arrived in her new home port Mayport Fla. She conducted refresher training in the Guantanamo Bay operating area in May and June and returned to Mayport on 3 July. The warship resumed east coast operations until 27 August at which time she deployed to the Mediterranean once again. That four month deployment ended on 17 December when the guided missile frigate reentered Mayport. For the next six months William V. Pratt conducted operations out of Mayport. She voyaged twice to the West Indies and once to the Gulf of Mexico. The warship also operated briefly off the Virginia capes. In July of 1966 she deployed to the Mediterranean for the third time in her career. She conducted operations with the 6th Fleet for the next five month s departing the Mediterranean for home on 10 December. She arrived back in Mayport 10 days later. Following six months of normal operations along the east coast and in the West Indies William V. Pratt departed Mayport on 20 June 1967 for her only deployment to the western Pacific during the American involvement in the Vietnamese civil war. En route she transited the Panama Canal and made port calls at San Diego Pearl Harbor Midway and Guam before arriving in Subic Bay in the Philippines on 28 July. Early in August she departed the Philippines for the Gulf of Tonkin and duty on the norther n sea-air rescue (SAR) station. She relieved Berkeley (DDG-15) on 12 August and remained on station in the gulf until early in September. After upkeep in Subic Bay she headed back to the Gulf of Tonkin late in the month to take up duty on the sout h SAR station. That tour of duty lasted until the latter part of November at which time she departed the gulf for port visits to Hong Kong and Kachsinng on the island of Taiwan. She did one more period of duty on the south SAR station before leaving the w estern Pacific via Yokosuka in Japan Midway Island and Pearl Harbor. The warship arrived in San Diego on 31 December. On 2 January 1968 she resumed her voyage back to Mayport. William V. Pratt transited the Panama Canal on 10 January and reenter ed her home port on the 16th. In February 1968 the warship moved to Charleston to prepare for regular overhaul. On 1 March she entered the Charleston Naval Shipyard and began a six-month repair period. She departed Charleston on 6 September and arrived back in Mayport two days later . After refresher training in the West Indies William V. Pratt resumed her routine of alternating 2d and 6th Fleet tours of duty. Over the next four years the guided missile frigate was deployed to European waters once each year. She departed May port on 7 January 1969 and set a course for the Mediterranean. She reported for duty with the 6th Fleet on 18 January and for the next five months conducted the normal round of port visits and exercises. On 1 June she arrived in Rota Spain for turnov er ceremonies before heading north on the 3rd for a series of hunter/killer exercises and visits to northern European ports. She concluded that assignment on 7 July when she departed Portsmouth England to return to the United States. The warship arrived back in Mayport on 15 July and resumed normal 2d Fleet operations. That employment lasted until 30 April when she pointed her bow eastward again and headed for the Mediterranean. In addition to the usual exercises and port visits that deployment include d duty with a special contingency force assembled in the eastern Mediterranean in response to Syrian intervention in the Jordanian civil war on the side of militant antigovernment Arab guerrillas. She steamed around off the Levantine coast from early Se ptember to early October before the American show of force finally succeeded in securing a Syrian withdrawal. The warship then resumed normal 6th Fleet operations until 1 November when she departed Barcelona Spain on her way home. For the remainder of 1970 and during the first seven months of 1971 William V. Pratt operated out of Mayport along the east coast and in the West Indies. Her 1971 deployment began early in August but it consisted of a cruise to northern European waters for hunter/ killer exercises and visits to northern European ports rather than a Mediterranean cruise. She returned to Mayport on 8 October and on the 29th began converting her main propulsion plant to the use of Navy distillate fuel. She complet ed that modification on 17 January 1972 and resumed local operations until 18 February when she got underway for duty with the 6th Fleet. The warship participated in the usual schedule of training evolutions multiship exercises and port visits through t he spring and early summer. On 28 June after turnover ceremonies at Rota the guided missile frigate headed home. She reentered Mayport on 8 July and began post-deployment standdown and preparations for her decommissioning incident to a major modernizati on overhaul. In September she moved to Philadelphia for the antiaircraft warfare (AAW) modernization overhaul. William V. Pratt was decommissioned at the Philadelphia Naval Shipyard. William V. Pratt was recommissioned at Philadelphia on 6 October 1973 Comdr. Rodney B. McDaniel in command. On the 23d she departed Philadelphia bound for her new home port Charleston S.C. She arrived at her destination on the 26th. The guided missile frigate conducted post-overhaul shakedown training in December and resumed 2d Fleet operations early in 1974. Those operations continued until 23 September at which time she departed Charleston to deploy to the Mediterranean once again. She chang ed operational control to the 6th Fleet at Rota Spain on 2 October. The following day the warship entered the Mediterranean proper and began operations as a unit of the screen for Independence (CV-62). For the next five months William V. Pra tt conducted exercises with carriers Independence and Saratoga (CV-60). She ranged the length and breadth of the "middle sea " making port visits and performing the usual training missions. On 8 March 1975 she conducted turnover at Rota and got underway for Charleston. The warship reentered her home port on the 19th and after about a month of post-deployment standdown for leave and upkeep she resumed normal 2d Fleet operations. Those missions brought an NROTC midshipman cruise in May and readiness exercises in June. On 1 July 1975 William V. Pratt was reclassified a guided missile destroyer and received the designation DDG-44. On 14 August she departed Charleston to participate in UNITAS XVI a series of multinational exercis es conducted annually with units of various Latin American navies. Those exercises occupied her time for most of what remained of 1975. On 8 December the warship arrived back in Charleston and began holiday leave and upkeep as well as preparations for a restricted availability. held at New York on Independence Day-continued through the summer of 1976. On 4 October William V. Pratt departed Charleston in company with Jesse L. Brown (FF-1089) Julius A. Furer (FFG-6) and Valdez (FF-1096) for anothe r tour of duty with the 6th Fleet in the Mediterranean. The ships arrived in Rota on 14 October completed turnover briefings and entered the Mediterranean on the 16th. The warship served in the screen of Franklin D. Roosevelt (CV-42) for the bulk of her 6th Fleet assignment. Once again she visited ports and conducted exercises throughout the Mediterranean. That tour of duty with the 6th Fleet lasted until the beginning of April 1977. After turnover at Rota the guided missile destroyer got under way on 11 April to return to the United States. She moored at Charleston once again on 21 April and on the 27th entered the Charleston Naval Shipyard for a 10-week availability. She completed repairs on 8 July and resumed 2d Fleet training operations ou t of Charleston. That employment continued through the end of 1977 and into 1978. On 11 July 1978 she departed Charleston for another deployment to South American waters to participate in UNITAS XIX. During that cruise she completed a circumnavigation o f the South American continent while engaged in a series of readiness exercises with Latin American navies. She returned to Charleston on 3 December and spent the remaining days of the year in port.